Insider threat is the cause of most reported cybersecurity incidents. You need a security product that will help you detect and respond to threats before data is corrupted or exfiltrated from your network. 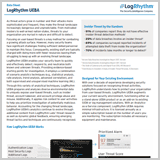 LogRhythm UEBA (user and entity behavior analytics) delivers the features you need to protect your network from both known and unknown threats. Cyber threat intelligence is improving prevention, detection and response capabilities. In 2018, 81% of respondents affirmed that CTI is helping, compared to 78% in 2017 and 64% in 2016.